All year the Lockheed Martin stock price (NYSE: LMT) has been sensitive to developments in the Joint Strike Fighter program. This is making Lockheed Martin Corp. relatively volatile for a company of its size – closing between $188.37 and $206.62 in 2015. But this is a case of traders letting uncertainty get the better of them. Underneath all this, the JSF program makes Lockheed Martin stock a long-term buy and hold. The JSF program has at the center of it the controversial F-35. This plane is the next generation of combat aircraft set to replace all past generation fighters. And it's a massive program. When it goes operational, it will capture 50% of the jet fighter market globally, according to Teal Group analyst Richard Aboulafia, as reported by National Defense in September 2014. This program will virtually force all other players out of the global combat aircraft market and leave only Lockheed Martin. That space is crowded right now with not just Lockheed, but also Boeing Co. (NYSE: BA), U.K.'s BAE Systems Plc. (OTCMKTS ADR: BAESY), the Italian Alenia Aermacchi (OTCMKTS: FINMF), and the French Airbus Group (OTCMKTS ADR: EADSY) all competing on orders. At some point, Wall Street will come to understand the scale of this program. And when these F-35's do start combat missions, it's going to wipe away all the F-35-driven volatility that has plagued the Lockheed Martin stock price to start the year. The F-35 program represents the largest contract in procurement history. The U.S. government plans to buy 2,400 of these multi-role combat fighters. Foreign governments will add another 600 orders. In his most recent budget, U.S. President Barack Obama's budget increased F-35 purchases to 57 fighters for fiscal year 2016, up from 38 the year before. This is at a price tag of $10.9 billion. That's a good chunk of money right there going to Lockheed's coffers, but it's just the beginning. The program is projected to cost $400 billion to purchase all those fighters. Another trillion will finance maintenance and upgrades over the program's lifetime. And this is a stream of revenue that will feed into Lockheed Martin's earnings – and by extension, stock price – over the 56-year life cycle of the program. This means LMT is the lead contractor of a program expected to return an average of $25 billion a year. 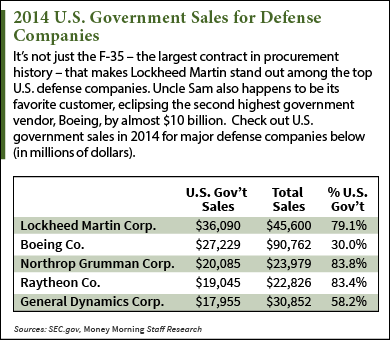 To put that in perspective, Lockheed Martin's total sales to the U.S. government for 2014 totaled $36.1 billion. That means that the F-35 could on average bring Lockheed Martin the equivalent of 70% of its 2014 U.S. government sales each year over the life of this program.